Trachten Lederhosen Felix in Antique Brown with Belt. 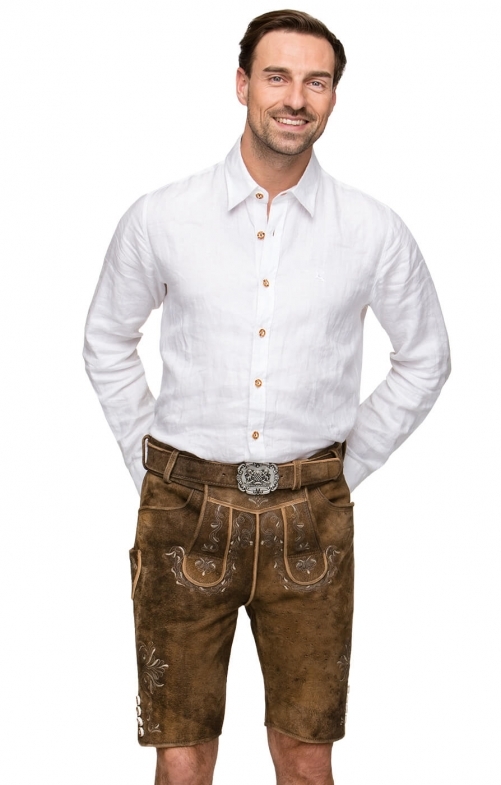 These high-quality, rugged Lederhosen in antique-brown leather are styled for a contemporary look with a matching wide belt with large silver buckle. They are beautifully embroidered with typical Bavarian motifs in ivory and are accented with chunky horn buttons to provide an authentic finishing touch. Ties at the rear of the waistband are adjustable for a customised fit: these Lederhosen are both smart and practical, whether worn for an Alpine hike, a festival or Oktoberfest. Thanks to the soft leather, Felix Trachten Lederhosen are extremely comfortable to wear and will even improve wth age as the leather acquires a patina.